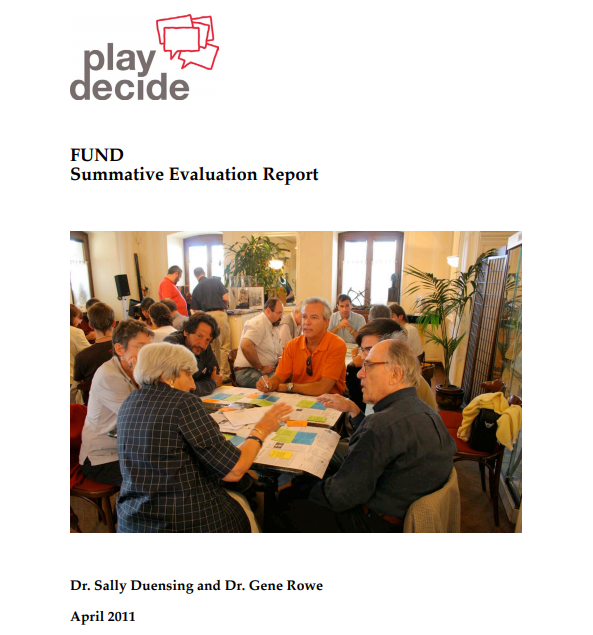 The evaluation effort of the FUND project was to see how the outcomes of the MicroFUND projects supported or contributed to the overall FUND project aim of the deepening of a museum’s or other participating institution’s role in civic activities through participating in a local network to adapt and use PlayDecide to address a local concern or issue. The evaluation (See pdf file attached) was focused in two overlapping areas – networking and project activities. Reflecting this approach, the report first presents activity aspects of the evaluation study written by Dr. Sally Duensing. The report then presents outcomes of the networking related components which were written by Dr. Gene Rowe. A discussion section follows these two parts. "PlayDecide" was originally created as part of the EU-funded project "Decide" (2004-2007) and coordinated by Ecsite. This game took inspiration from a card game called "Democs", developed by the New Economics Foundation between 2001 and 2003. It enables players to get familiar with a question, see it from different perspectives and form or clarify their own opinion by encouraging simple, respectful & fact‑based group discussion. In 2018 Ecsite decided to give the ageing platform a makeover and funded its redevelopment. New features include an online step by step tool for facilitators, helping them guide players before, during and after the game.